Plancha sole has to be one of my best grilled fish recipes because it's so simple and cooked in 10 – 15 minutes. 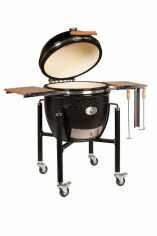 In Spain the cooking method described as “à la plancha” which basically means cooked on the hotplate barbecue grill. Grilled fish recipes using this style of cooking are so simple and with a few fresh ingredients to bring out the flavour, you're onto a winner. Alfresco dining at its best! If you want to use another type of grill then don't worry, this recipe will work just fine for that too. As an example, check out the grilled sole recipe that I did with lime and chili. In this case I used a charcoal barbecue grill and a Teflon barbecue fish mat to ensure that the fish didn't break up when cooking. 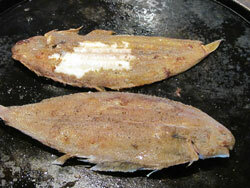 Dover sole is considered one of the finest flat fish. It has a bark brown skin and delicious pale firm flesh, it's available all year round but best between November and April. TIP - When you buy the sole, get your fishmonger to trim the fish fins because these are extremely bony. It's up to you whether you leave the heads on or not. I think it looks better presented on the plate with the head on but I understand that this isn't everyone's cup of tea. Wash the fish and dab (no pun intended) with kitchen towel. Now after that it's really easy, just drizzle over the dark top side of the sole (not the white belly) lemon juice and sprinkle lightly with salt and pepper. Soften the unsalted butter and brush it on top the sole and now place this side directly onto the plancha grill to cook for 4-5 minutes. Your Dover sole is now cooking white side up so repeat the process of lemon juice, salt, pepper and butter on this side and then when your 4 -5 minutes is up, flip the fish. Why do it this way? It's simply so that you don't have to turn the fish any more than you have to and prevent the fish breaking up before serving. In other words you only need to turn the fish once during the cooking process before serving right side up. You can pretty much cook the fish all the way on the dark side and just flip over to the white side to finish. When cooked take the fish off the heat and carefully remove what's left of the bony fins, this should come away in one long strip. Remove these bones from the board before taking the next step otherwise you'll end up contaminating your lovely fresh fish with the bones again. To take the meat off the bones use a knife to part the fish from the centre to the side and you should get two flat fillets. Use a long spatula to place these on the plate, turn the sole over and repeat the process. Serve with boiled new potatoes, steamed veg and a lemon butter sauce for a gourmet treat that makes for a tasty main course. Sole à la plancha – grilled fish recipes don't come any easier than that do they?